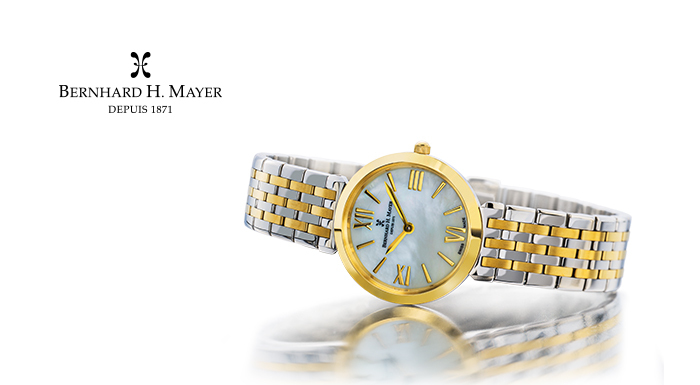 Beauty meets class with the Bernard H. Mayer ® Thalia ladies’ watch. 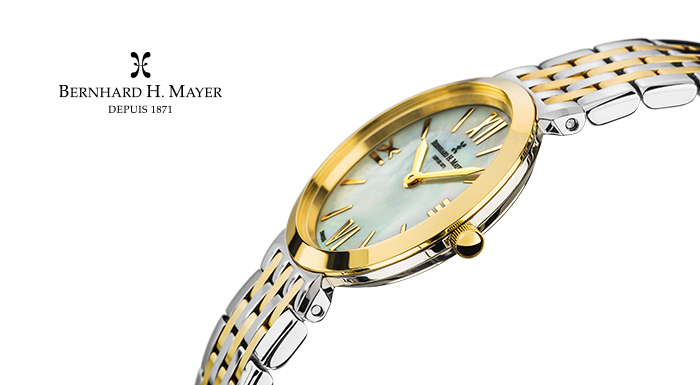 With its slim and elegant exterior, it exudes a feminine aura that every modern woman will love. 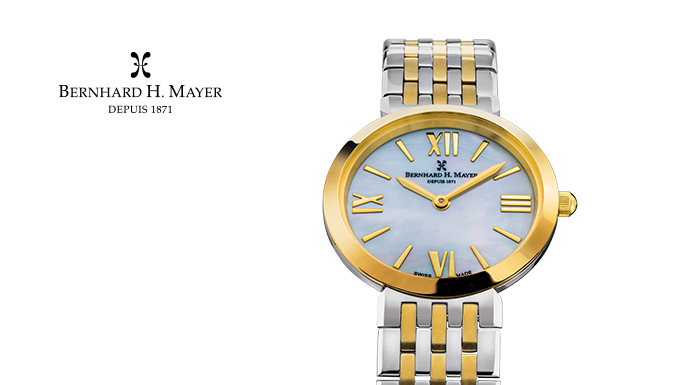 It comes in two variants, one in stainless steel and the other in a two-toned yellow-gold plated. 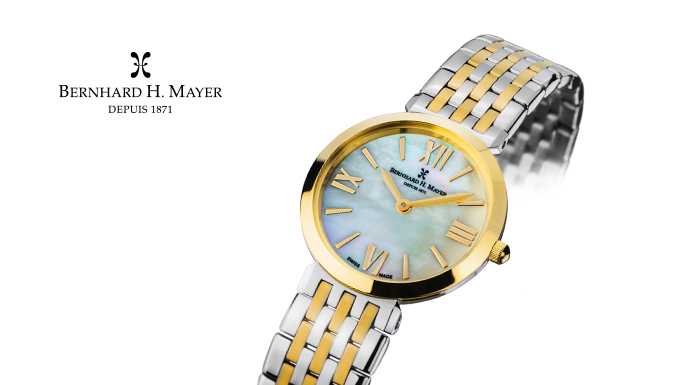 Both designed with a Mother of Pearl dial that gives off a delicate and classic detail, plus its unwavering quality-performance that perfectly encapsulate sophistication, this Swiss-made masterpiece is one that every woman should own. If you have a hand-wound watch, it is advisable to wind it every morning. Mechanical watches must be serviced at least every three to five years to have the mechanics checked and relubricated. The tiny parts inside the watch are under tremendous strain, so friction is their greatest enemy. Lubrication prevents the bearings from drying out and grinding away the steel parts. Exposing your watch to high temperatures, such as placing it on the dashboard of your vehicle or submerging it in a hot tub, may cause the watch to malfunction, may shorten battery life, or may damage its internal components. Leaving the watch in extreme cold temperatures may cause irregular timekeeping. Do not expose an analogue quartz watch to magnetism. If you do, it may temporarily stop operating or may show gain or loss in time. 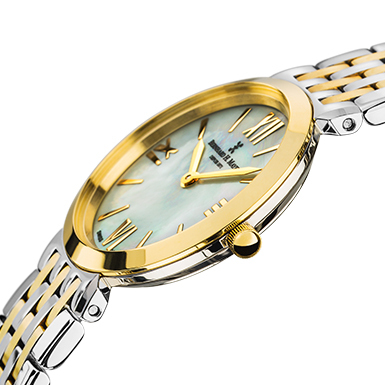 To ensure that it maintains its water resistance, make sure the crown of the watch is always pushed against the case. You should have your watch checked once a year for water resistance. Condensation inside your watch is an indication that its water resistance has been affected. For maximum performance, regularly wipe your watch with a clean, soft cloth. Stains, water spots and dirt that have accumulated on the case, crystal or bank may cause premature wear. If you use your water-resistant watch in the shower, chlorinated water or saltwater, rinse it with fresh water and dry it thoroughly afterwards. A watch may have a scratch-resistant sapphire crystal face, but that doesn't mean you should toss your watch on top of the dresser or into a drawer at the end of the day. It is better to store or wrap it in a soft cloth before placing it down. Replace broken or scratched crystals immediately. Even a hairline crack can bring dust or moisture into the mechanism, affecting the accuracy. If you participate in activities that cause you to sweat excessively, you may want to consider getting a watch with a metal bracelet or rubber strap, rather than a leather strap. Since the metal bracelet is worn next to the skin, it collects dust and perspiration, which becomes soiled if not cleaned regularly. This is particularly true of the inner mesh of the bracelet. When soil and rust are present in a bracelet, they are dissolved by perspiration and can cause staining of the cuffs and, in some instances, irritation of the skin. Wipe dirt and perspiration off with a soft, dry, lint-free cloth. If the watch is water resistant, you can occasionally clean the bracelet with a soft brush and warm soapy water. Dry the bracelet completely. 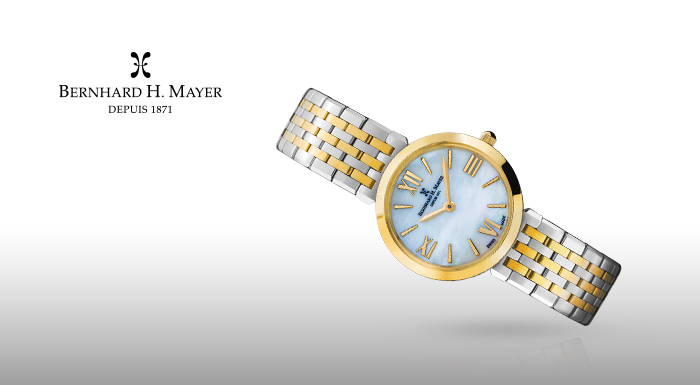 A toothpick can also be used to clean any dirt that has built up in the bracelet or casing of the watch. Straps that are made of natural and genuine leather will gradually deteriorate with constant exposure to perspiration. If not cleaned, perspiration can wash out the natural oils and cause the leather to become dry. Any moisture should be blotted with a soft cloth or paper towel and the strap should be allowed to dry naturally. Salt residue and soil can be removed from leather straps by cleaning it with a dampened soft cloth and mild soap (or saddle soap, which is special leather soap). Wear the strap slightly loose, with an allowance of one finger space between the wrist and strap. This invites air circulation and allows any moisture to evaporate. Rubber straps should be washed frequently with mild soap and warm water using a soft brush. Solvents, oils, perspiration, tanning lotions and salt can cause rubber to deteriorate if not removed.